After undergoing major renovations and extensions over the winter. Doolin Inn is a boutique, eco-conscious family-run accommodation who focus on getting the simple things right. • Great Coffee, Irish Craft Beers, home baking and more. Our doorstep is the start of the Cliffs of Moher Hiking Trail. Located at the start of Fisher Street, we are a 2 – 15 minute walk to all pubs restaurants and shops in Doolin. We are the Doolin Bus Stop and Ticket Office. And a 15 minute walk for Ferries to Aran Islands and Cliffs of Moher Cruises. Although in the centre of the village, slightly elevated, we are surrounded by green fields, with views of Doolin, the Ocean, Castle and our gardens. With the Ocean a little more than a stone’s throw away, wake up each morning to the smell of the ocean and wild fresh air. 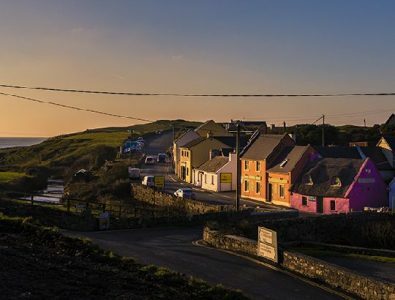 Anthony and Deirdre Moloney returned home in 2012 to take over the Doolin Hostel buildings. (The Doolin Hostel still exists in the building opposite.) And taking their years of international hotel management experience and mantra of improving a little every day they have developed the main business into the Doolin Inn. With a focus on getting the simple things right, such as a hotel quality bed for a good nights, sleep, a strong hot shower, and a great cup of coffee. Delivered by a team of professionals who enjoy welcoming you into our home as we would a long lost friend.